natgeo Photo by @Jayaprakash_bojan | After over 11,000 photo submissions from around the world, our panel of judges has named the 2017 National Geographic Nature Photographer of the Year! 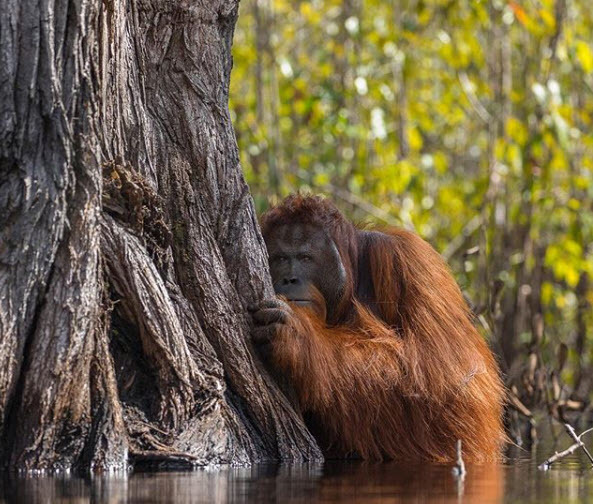 Jayaprakash Joghee Bojan of Singapore is this year’s grand prize winner for his stunning shot of an enormous male orangutan, waist-deep in a river, shyly peeking from behind a tree. Our judges were impressed by how the poignant image spoke to the impact deforestation is having on the habitat of this critical endangered species. See all of this year’s spectacular award-winning photos at ‪natgeo.com/photocontest‬ (link in profile).